While writing a short article on speed reading this morning I was tempted to digress down an intriguing side alley. A valued tool of many speed readers is the “pointer”. It turns out that the pointer does not have any more technical name as it is often just a pen or pencil used to synchronise the reader’s eyes with the page. 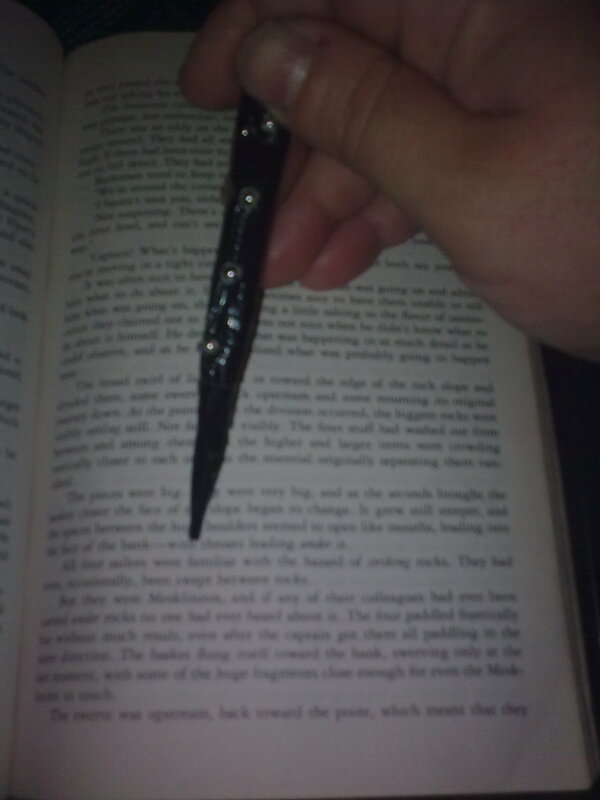 This simple device is invaluable as an aid to reading smoothly and at least deserves a name of its own. Perhaps the best name it has been given is a “reading wand” which seems appropriate because the written word is pure sorcery after all. A Pointer or wand held in the hand enables the reader to keep a steady pace across the page from left to right while discouraging re-reading. It provides a kinetic connection with the page, linking the brain to the hand and eye simultaneously in a way that makes reading quicker and easier. In fact, the pointer should be elevated to the status of “reading companion” and at least afforded the same status as a bookmark and spectacles among any self-respecting reader’s accessories. Where are those who have given the humble pointers their due and turned them into an art form in their own right? This handmade, industrial-themed pointer is a screwdriver covered in duck tape and studded with ball bearings. Making your own pointer could be a great craft activity for young children who are learning to read and gives me a use for the twigs I idly whittle with my penknife but it reaches its most elevated form in the “yad”. Typically fashioned from silver, the yad, which literally means “hand” is used for reading the tight lines of the Torah; and, in this case, from right to left as Hebrew is written. Yads can be extremely ornate, indicating the high value invested in the reading of the scriptures. As an advanced reading wand user, I use mine to skim the right margin of the lines as my eye travels down the page but a beginner will probably want to hold theirs as shown and travel from left to right until faster speeds are achieved. Would anyone like to take me up on the challenge of making a finely crafted reading pointer, wand or yad?